Welcome to the live blog of our annual Safer Salford Forum on Tuesday 12th March 2019. 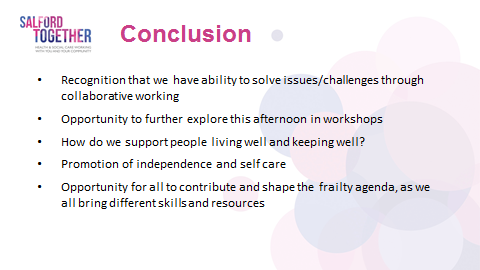 Today’s event will focus on “Frailty: Living and Ageing Well”. We know that failure to effectively connect the health and care system has the greatest impact on those who need our services the most. This event will be an opportunity for system leaders to come together to influence the design and delivery of health and care models in Salford. 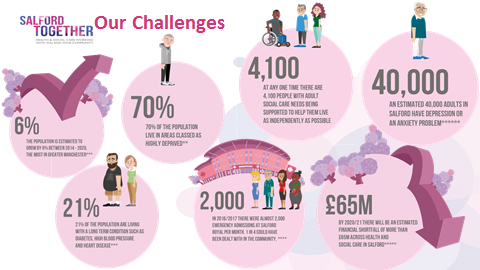 The Greater Manchester Health and Social Care Partnership recently launched a new Frailty Charter, with input from regional and national experts, providing a framework to align clinical services to better identify and support our frail population. We will use this as the foundation for our approach here in Salford. As we seek greater integration across traditional boundaries of health and care providers, the Safer Salford programme provides an opportunity to ensure that transformative change delivers improvement in quality and safety for the people we serve. We begin by a welcome and introduction by Abigail Harrison, Head of Innovation and Consultancy at Haelo. Abigail starts by explaining how the day has been set up to meet different people and talk together. We then go straight into an ice breaker; find your crew! The first session of the day is led by Paul Walsh, Head of Integrated Commissioning at Salford City Council/CCG. Paul wants to putt the scale and nature of frailty into context. 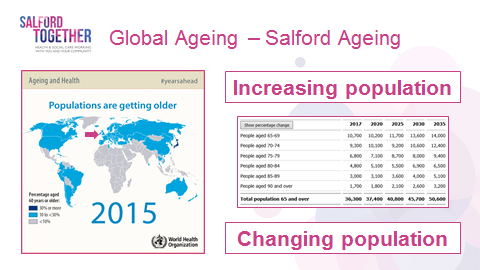 The population is ageing, and Paul shows some interesting statistics not only about the global ageing population, but also that in Salford. Progressive thinking about frailty as an enabler to healthy ageing. The session is then handed over to Dr Tim Pattison, Consultant Geriatrician at Salford Royal Foundation Trust, to discuss what we actually mean by frailty. You can be old, but that doesn’t mean you have to be frail. A state of increased vulnerability to poor resolution of homoeostasis after a stressor event, which increases the risk of adverse outcomes. More likely that something will happen to you. Your outcome will be worse. Frailty is not necessarily a binary thing, instead there is a scale. 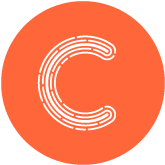 A clinical frailty scale can help decide on the required intervention for that person. It can predict how well a person will do after an operation, for example, to help signpost future care for them. Tim ends this session by reflecting back to the GM Frailty charter, and the recommendations that should be implemented. The next session is our keynote; Reflections from a system leader by David Fillingham, Chief Executive of AQuA. David begins by sharing 3 images that mean something to him. How do you create an inspiring vision? After a quick coffee break, we are moving on to look at new models of care in Salford. This session will be divided into 3 presentations; Learning from Integrated Care, Digital futures, and Safety Medicines. Mark Albiston, Head of Adult Social Care at Salford Care Organisation leads the first part, Learning from Integrated Care. He begins by identifying the key challenges in Salford. Salford have the ability to redesign the system and how we do it. 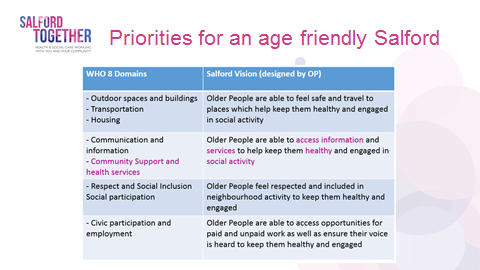 There is further information on these programme priortities on the Salford Together website. 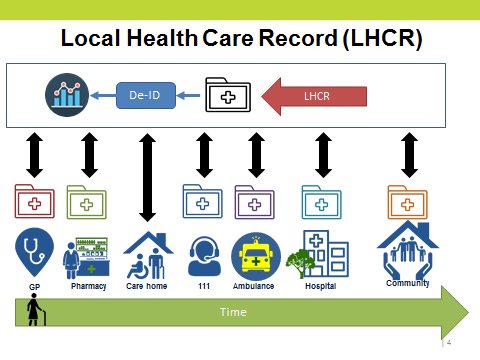 The next part of this session is led by Paul Moore, Acting Head of Interoperability at GM Health and Social Care Partnership. Paul begins by talking about the requirements of frail citizens to help support them across health, social care, and local government. The final part of this session is led by Claire Vaughn, Head of Medicines Optimisation at Salford CCG and Lindsay Harper, Director of Pharmacy at Salford Royal NHS Foundation Trust. Claire and Lindsay begin by looking at the integration and learning from Safer Medicines. They are starting to shift the aims of the programme to respond to progress. Following quick discussion times on their tables, the group have the chance to put some further questions to the presenters. Q. 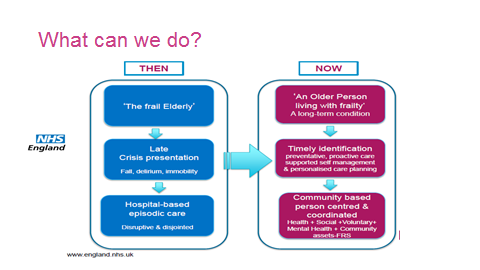 How is frailty being identified in the wider community team? A. Sporadically. Part of being here today will allow us to be more systematic with this approach. Q. What is the timescale for getting neighbourhood teams fully functional? A. It is important to recognise boundaries and how we can learn from each other. The group are asked, what is your vision for the future? Does the starting point need to be before looking at the health and care system? Workshop 1 is all about predicting, identifying and assessing frailty. This workshop begins by asking the group to read through the frailty standards and then discuss. The group raise concerns about how to engage the primary care system with these standards. The group then moved on to look at identifying frailty. They noted that there is a lack guidance, pathways are different with different CCGs. There also needs to be a balance between objective and subjective tools. The final part of the workshop focuseses on assessment of frailty. The group discussed lots of options including; what should you assess, where and when? Should a person be assessed at their best? Workshop 2 focuses on living with and managing frailty. The group then begin to look at what does the term frailty mean to you? There are considerations around who is, or needs to be involved in supporting frailty to ensure that people start well, live well, and age well. Is there a prevention role? Who has a role and what can be offered? Workshop 3 is all about what we can learn about safety and frailty. The workshop is broadly broken down into 2 halves; a common understanding of safety, and safety in the context of frailty. The STEEEP principles are there to help identify where does safety fit. Safer Salford will learn from the latest thinking about safety in health and care, applying this to ensure care delivered in Salford is the safest in the UK. 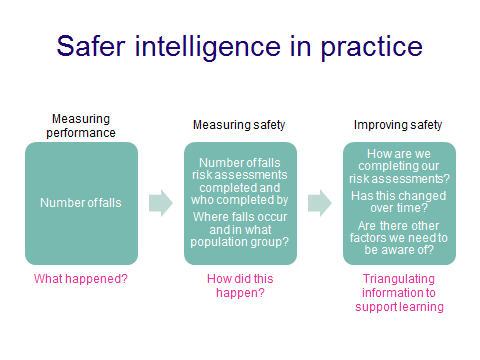 Safer intelligence in practice will enable safety to improve. Following the workshop sessions, the group are using the Time to Think technique to answer some key questions such as, what will you take away from today? The final session of the day is the leadership panel discussion. The session is chaired by Jeremy Tankel, Clinical Lead for Quality and Safety at Salford CCG, the rest of the panel are made up of Mark Albiston (Salford Care Organisation), Tim Patterson (Salford Royal NHS Foundation Trust) and Jean Rollinson from Age UK. As the panel take questions from the group, it shows what interesting discussions have been going on throughout the day. Many of the discussions are not just around what the people in the room can do to improve frailty, but also looking at age friendly cities, and what can the wider system do to improve this. It is important to improve things at a neighbourhood level. We need to take our ideas back to the people who this will actually affect to find out what is important to them. Francine Thorpe, Head of Quality and Innovation at Salford CCG wraps up the day. Francine is the lead for Safer Salford across the system. Francine begins by reminding the group of how important it is to recognise the strength of our relationships in Salford. Francine wraps up by thanking everyone for their attendance, and reminding us of what a great day it has been all round.